A delicatessen is a restaurant that offers hand-prepared sandwiches and side dishes that are usually made to order. Typically, the food that is served at a deli is prepared and delivered quickly. Hot items are sometimes included on a deli menu, but the majority of sandwiches and salads are served cold. Deli menus vary widely and can include any number of regional or specialty dishes. However, there are a few standard items that pop up on most deli menu boards throughout the country. Including these five deli staples on your menu is a great way to begin building you own deli menu. The club sandwich is one of the most popular and consistent menu items served at a delicatessen. A club sandwich is prepared by using three pieces of bread and filling each slice with different types of meat, vegetable, and cheese in between these three slices. Commonly, a club sandwich features turkey and ham, though bacon, roast beef, salami, and even bologna are sometimes used. 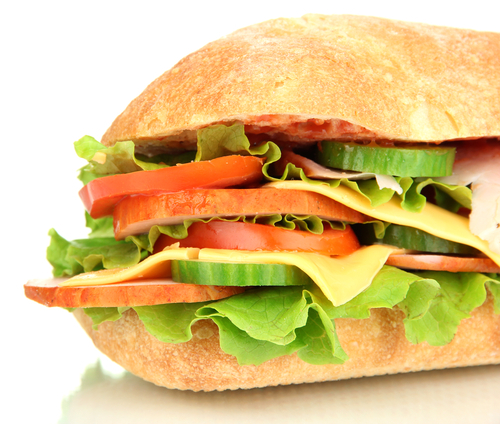 A club sandwich must have lettuce and tomato, and some delis add pickles, onions, and even peppers to the sandwich. Traditionally, a club sandwich is dressed with mayonnaise and cut into triangles that are stacked together with toothpicks. During the cold months of the year, including a soup of the day on your menu is a great way to warm your customers up and to satisfy their cravings. Soups such as chicken noodle, vegetable beef, tomato, and chowder are always popular on a deli soup of the day menu. "Wet" salads like potato salad, chicken salad, and tuna salad are made by binding a variety of ingredients together with mayonnaise, salad dressing, or even mustard. These wet salads are very popular in delicatessens. Potato salad is often served as a side item, and chicken or tuna salad may be spread on slices of bread to form a sandwich. A French dip is a popular sandwich made of roast beef. It is usually served hot and accompanied by a thin beef gravy known as au jus. This is one of the most popular deli sandwiches. It may seem strange to have a necessary menu item that is not prepared or manufactured within the deli, but potato chips are definitely a necessity for your deli menu. The concept of a sandwich paired with potato chips is so engrained in the consumer concept of a delicatessen that you risk seriously upsetting customers if you don't have this starchy snack food on the menu. You don't need to offer a wide variety of flavored potato chips or salty snacks. Usually, a plain, kettle-cooked potato chip brand is the perfect way to satiate a customer who is craving something salty. Not all delicatessens will offer all of these menu options, but if you are starting a deli from the ground up, it's a good idea to start with these basics and then expand your menu to suit different tastes or explore new themes. These deli standards will likely be your most popular menu items, so including them at all times will ensure that you can please customers and make a profit.